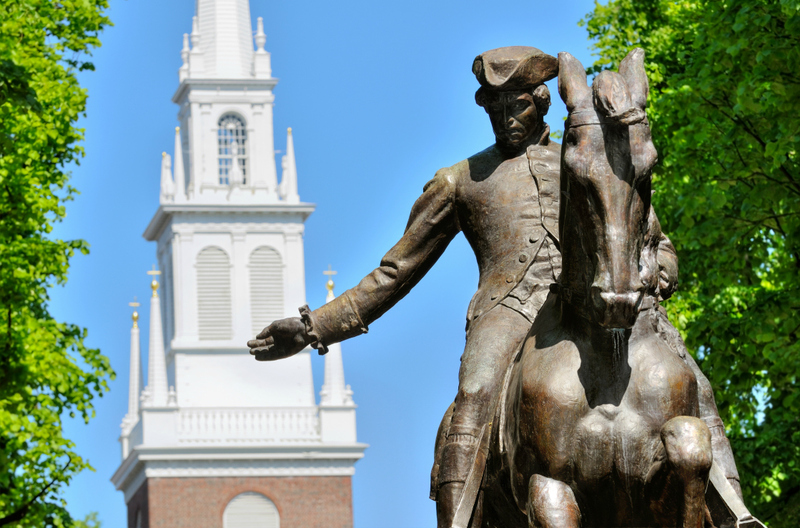 Home to 16 historic sites that played a major role in securing America’s liberty in 1776, the 2.5-mile meander along the city’s Freedom Trail is a fascinating introduction to Revolutionary War-era Boston. Here are our top three hotspots along the trail. 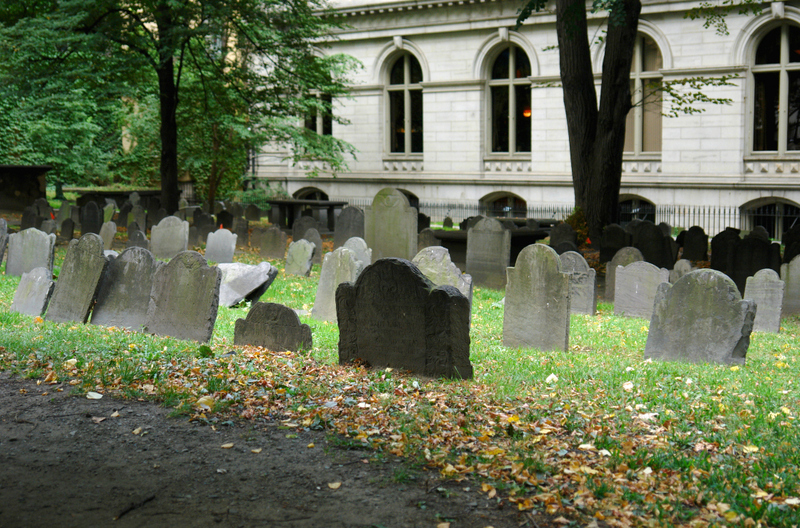 Walk the rows of graves at Boston’s oldest cemetery to see the intricately carved headstones of the first generation of English settlers. Green, peaceful and framed with old trees, this tranquil spot sits in the long shadow of King’s Chapel – the first Anglican Church in overwhelmingly Puritan Boston, paving the way for religious freedom in America. Such is the tangible sense of history as you wander between the graves of the notable colonial figures, you can almost hear their voices. Among them are Suffolk-born Puritan elder John Winthrop, the first Governor of Massachusetts, and Mary Chilton – the first Englishwoman to step ashore in New England. Keep an eye out for the ghoulish carvings of Death depicted as a skeleton – a reminder for these early settlers that in this unpredictable era, life was perilous. Standing tall in Boston’s Downtown Crossing area is one of the most historically significant places in the US. The Old South Meeting House marked the beginning of the American Revolution. It was here that patriot leader Samuel Adams organised the Boston Tea Party by arranging for 60 members of secret society Sons of Liberty to dump more than $700,000 worth of tea into Boston Harbour as an act of rebellion against the British. In 1773 more than 5,000 people – one-third of Boston’s population at the time – gathered here for the city’s largest-ever political meeting. You can easily imagine the murmur of tense Colonists awaiting news, as well as the impassioned cries for liberty from thousands of frustrated men, women and children – even 250 years later. Wandering around the former home of American industrialist and Patriot Paul Revere gives you a true taste of what it would have been like as a middle-class American in Colonial Boston. By the time he arrived in the city in 1770, his home was already 100 years old, making it the oldest house in central Boston. Nowadays it’s preserved as a museum, where the first thing that catches your eye after you step through the Tudor doorway is a domineering Elizabethan fireplace on the ground floor. Soak up the little light that’s let in by the small diamond-paned windows – a complete luxury in Revere’s time – and marvel at the antique furniture, saddlebags and pistols as your heels clip-clop on the timber floor. Take in the history attached to these sites, as well as the many more littered along the Boston Freedom Trail. Hire a car in Boston to make the most of your visit to a city that’s bursting with history at almost every turn and fully deserving of its title as the Cradle of Liberty. It will also allow you to fully explore the Colonial history of the rest of Massachusetts.